With a long, sleek and wide stance body style, a 355hp EcoBoost V6 engine, an electronic six-speed with SelectShift automatic with paddle shift activation, an all-wheel-drive system, a sport-tuned fully independent suspension riding on 20X9in. polished aluminum wheels, plus a fully trimmed leather, wood and chrome luxury interior with seating for up to seven passengers and a cargo capacity behind the front seats of 75.9cu.ft., the all-new Lincoln MKT is indeed ‘supersonic luxury transportation. The all-new 2010 Lincoln MKT enters the luxury crossover segment with Lincoln’s signature design, roomy and sumptuous interior, and intuitive technologies that will make luxury customers’ lives easier-including adaptive HID headlamps, available adaptive cruise control, collision warning with brake support, active park assist and blind spot information system (BLIS) with cross traffic alert. 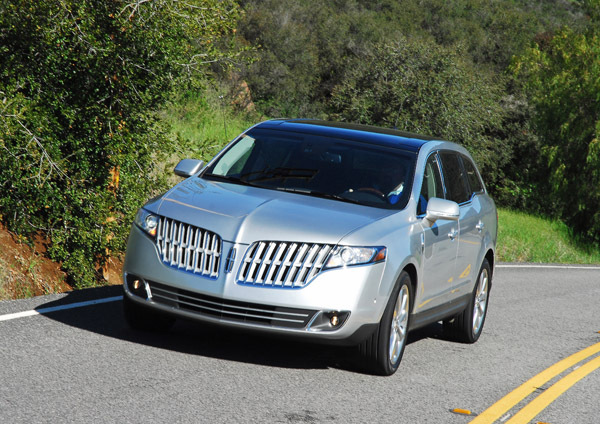 Lincoln is offering full-size luxury crossover customers a fresh new choice with the 2010 Lincoln MKT-a three-row crossover that delivers the optimal blend of distinctive design, power, performance, interior spaciousness, fuel economy and high-technology. Standard on every MKT is the brand’s signature design-complete with a split-wing grille, a beveled chamfer along the MKT’s shoulder line, a flowing cantrail that frames the greenhouse and full-width horizontal taillamps that span the subtly curved weight-saving magnesium liftgate that adds visual character while protecting generous rear cargo space. Down below are polished stainless steel dual exhaust tips to give a hint of the power residing under the hood. You get two choices of powerful, fuel-efficient V6 engines. A 3.7 liter, 24-valve is standard and generates 268hp at 6,500rpm and 267lb.ft. of torque at 4,250rpm. This engine has been tuned to provide brisk acceleration and smooth power delivery. A two-speed fuel pump and Aggressive Deceleration Fuel Shut-Off combined with optimized transmission and final-drive gearing allow this engine to deliver fuel economy of 17mpg/city and 23mpg/highway with front-wheel-drive. 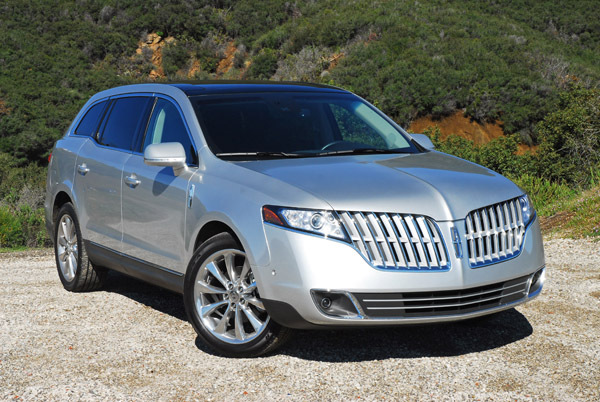 For even more performance-driving feel, Lincoln MKT also offers a twin-turbocharged 3.5 liter, 24-valve EcoBoost engine. This engine provides the power of a normally aspirated V8 with V6 fuel economy. 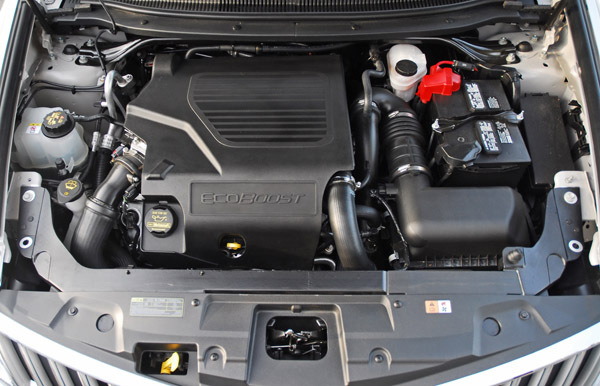 The EcoBoost V6 delivers a class-leading 355hp at 5,700rpm while generating 350lb.ft. of torque from 1,500 through 5,250rpm with fuel economy of 16mpg/city and 22mpg/highway. EcoBoost is a global Ford strategy to deliver the power that customers want, combined with the fuel economy that they need. Combining gasoline direct injection with twin turbochargers and a smaller-displacement engine, EcoBoost can match the power output of larger, naturally aspirated engines while yielding torque and fuel economy gains. Pressurized direct injection enables a higher compression ratio, while twin turbochargers work in tandem to reduce lag associated with earlier turbocharged engines. Even with additional horsepower, fuel economy is optimized by an increased compression ratio-enabled by charge cooling air-and sophisticated knock controls. Both V6 engines come with six-speed automatic transmissions but the EcoBoost engine is equipped with a six-speed SelectShift automatic. This advanced gearbox offers the driver a choice between fully automatic operation and manual control. In addition, paddle shifters are integrated into the steering wheel spokes. Intuitive to operate, a squeeze back on either paddle will deliver upshift, while a gentle push forward on either paddle will induce a ‘matched-rev’ downshift. This capability makes the MKT driving experience sporty, yet smooth. Unlike other competitive transmissions, SelectShift won’t ‘second guess’ the drive with an override shift. With SelectShift, manual control is truly manual controlled. All-wheel drive is optional on the 3.7 liter V6 equipped MKT. The AWD option enhances the MKT’s capability in a variety of weather conditions and adds traction and enhances stability on dry pavement. The sophisticated AWD system is fully automatic, using an advanced array of internal electro-mechanical clutches to efficiently distribute toque between front and rear wheels as needed. AWD is standard in the MKT with EcoBoost. The all-new MKT strikes an optimum balance between capable and driver-engaging handling while simultaneously delivering a smooth, quiet ride in al three rows. It combines luxury touring experience with an agile ride and available 4,500lb. Class III towing strength. Part of the reason for the quick, precise handling is the standard strut tower brace up front that gives fast and precise turn-in when cornering. Key elements of the MKT fully independent suspension development and tuning included front end lift on acceleration, offering stable and engaging steering and handling characteristics that provide confidence to all drivers, all while delivering a luxurious ride quality consistent with Lincoln’s brand character. A new rear suspension system features a ‘one for one’ shock absorber ratio. The resulting linear response gave the engineering team a stable baseline for suspension tuning, allowing the team to deliver a better balance between responsive handling and control as well as a smooth ride. It also improves rear suspension isolation and enables the use of 20in. wheels. Those 20in. wheels house big brakes that quickly and safely slow the MKT EcoBoost down from speed. Up front are 12.6in. vented discs clamped with dual, aluminum calipers, while 12.2in. vented discs in the rear are clamped with single, aluminum calipers. Adding control while braking hard is standard ABS, Traction Control and AdvanceTrac with Roll Stability Control. 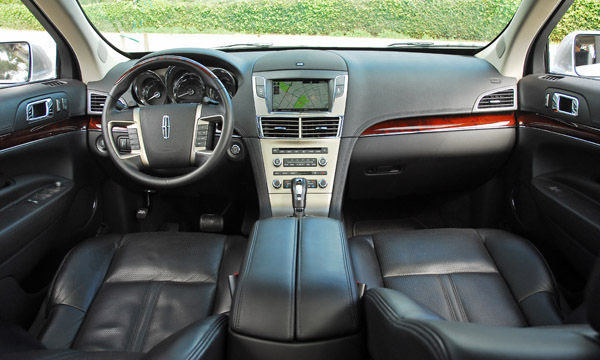 Lincoln MKT delivers a new level of quiet confidence that delivers best-in-class NVH control. Virtual modeling and wind tunnel test helped engineers optimize the vehicle, influencing everything from side-view mirror placement and special sound deadening in the bulkhead to extensive exhaust system isolation and the inclusion of both an acoustic windshield and dual-layer front side glass to specially reduce A-pillar wind noise. It is very quiet inside the MKT when driving at speed. 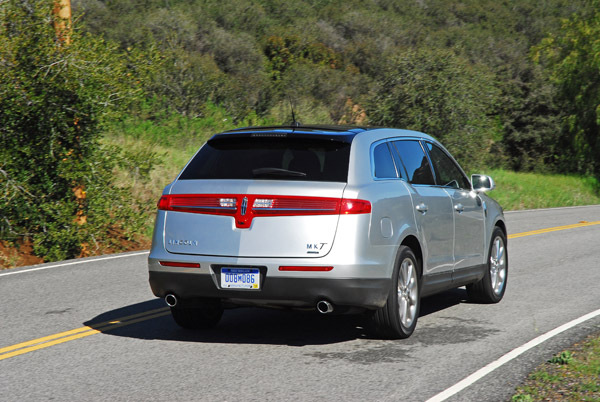 Lincoln MKT delivers abundant technologies aimed at making life luxurious for both the driver and three rows of passengers. A holistic approach was used to develop these amenities, where ease of use and intuitive operation were key objectives. Nowhere is this focus more apparent that Active Park Assist. 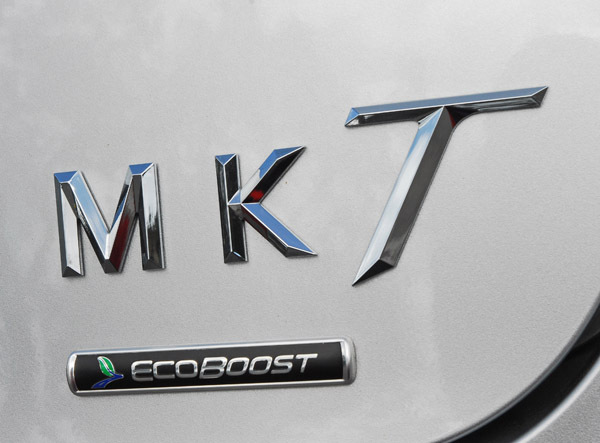 MKT with EcoBoost features advanced Electric Power Assist Steering (EPAS), which enables the optional Active Park Assist. This innovative technology employs an ultrasonic-based sensing system, as opposed to video camera-reliant competitive offerings, making hands-free parallel parking a breeze. Active Park Assist activates at the touch of a button just above the shift gate, reducing the risk of selecting an inappropriately sized parking space, detects the edges of adjacent objects to calculate optimized trajectory and steers the MKT while coaching you through conventional throttle and braking inputs. It also works in uphill parking situations, unlike competitive systems on the market. Additional MKT customer convenience features include adaptive cruise control, intelligent access with push button start/stop, securicode keyless entry keypad, adaptive HID headlamps, auto high beams coupled with adaptive headlamps, rain-sensing wipers, easy fuel Capless fuel-filler system, MyKey, blind spot information system (BLIS) with cross traffic alert, reverse camera system, and Lincoln SYNC. The available Navigation Package includes an internal hard-drive for map and point-of-interest information storage. THX Certified 5.1 surround audio system with 14-stragegically aimed premium speakers. A unique new technology, making its debut in the MKT audio upgrade is neural surround significantly improving the surround sound experience from compressed digital music formats. In addition, a SIRIUS Travel Link is included with the Navigation Package providing coast-to-coast weather data, forecasts, fuel prices, sports scores, movie listing and more. The interior is one of the most luxurious and functional on the market. 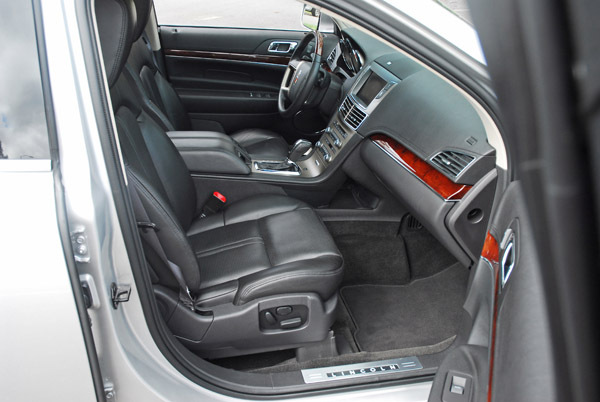 All four doors open wide for easy entry and access plus there are grab handles above all passenger doors. The rear magnesium liftgate is power opening and closing for ease of operation. The dashboard, dashboard shelf and door trim is custom hand cut and sewn premium leather. All seats are also trimmed in premium leather with the front bucket seats 10-way power adjustable with heated and cooled seat bottoms and backs. The dual floating armrest slide revealing dual cupholders and a deep and wide storage bin. The shifter is covered in leather and chrome and very easy to operate. You also get power adjustable pedals and power adjustable tilt-telescoping, leather and wood wrapped steering wheel with buttons for the cruise control and audio system. These give the optimum reach and angle for excellent control while driving. Straight-ahead and easy to see is the jewel-like acrylic instrument cluster with LED white lighting. All buttons, dials and switches are within easy reach and fully illuminated for safe nighttime driving. Standard equipment inside also includes dual map lights, 3-zone climate control, aluminum door sill plates with lighted Lincoln graphic, side pull-up sunshades, power windows/door locks with all windows express up/down, storage slots in all four doors, deep and wide glove box, dual lighted vanity mirrors, and thick cut-pile carpeting with floor mats. In addition, customers can choose how to best specify MKT which offers a choice of a standard fixed glass panoramic vista roof with power-assisted front and rear sunshades-or the available power panoramic vista roof, either six-or seven-passenger variations with two different second-row seating configurations. A standard 6/40 split folding rear cargo bench seat features heated outboard seating positions. Power ‘fold and tumble’ second-row seats with heating, cooling and power-assisted lumbar adjustment are also available. A rear console-mounted five-quart capacity refrigerator is available in the six-passenger seating configuration, an available dual headrest family entertainment system with twin-7in. DVD playback screens offering individual or simultaneous programming. The all-new Lincoln MKT features an advanced structural safety system that combines octagonal front frame rails, tunnel rails, and support members that are designed to absorb and redirect crash forces away from the passenger compartment. MKT also features side protection and cabin enhancement architecture (SPACE) incorporated to optimize side-impact occupant protection. 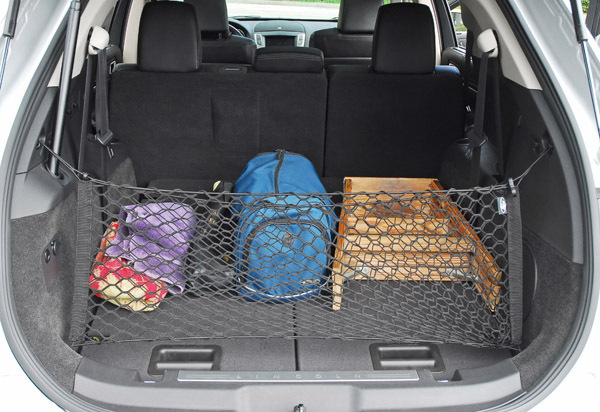 The SPACE system integrates a hydroformed high strength steel tube embedded in the floor that runs the width of the vehicle from B-pillar to B-pillar and along the rocker panels to form a safety cage to help protect passengers in side impact incidents. Other standard safety systems include a Safety Canopy system side impact protection system employing side curtain airbags to help protect front and outboard rear passengers in both rollover and side impact crashes, 3-point safety belts for all outboard passengers, front and side impact airbags up front, perimeter antitheft system, SOS Post Crash alert system which automatically flashes the turn signal lamps and sound the horn following the deployment of the airbags or front safety belt pretensioners and a tire pressure monitoring system. 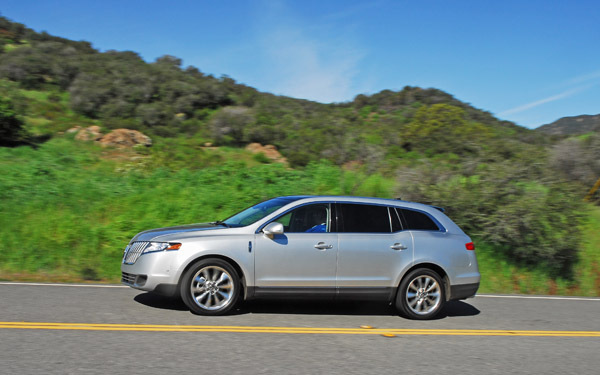 Full-size luxury crossover buyers now have another reason to choose Lincoln as their vehicle for a luxurious and safe ride with the versatility and functionality in cargo or seat arrangement that few other luxury full-size vehicles offers. Front Head Room: 40.1 in. Rear Shoulder Room: 58.1 in. Rear Hip Room: 55.9 in. Rear Leg Room: 41.8 in. Luggage Capacity: 17.9 cu. ft. Maximum Cargo Capacity: 76 cu. ft. Maximum Towing Capacity: 4500 lbs. Automatic: 297.6 mi. / 409.2 mi. / 334.8 mi.